From a superbly situated on St.-Emilion’s plateau, 38-acre vineyard planted on primarily limestone and clay, this 2006 is meant for long-term aging. A combination of 80% Merlot and the rest Cabernet Franc and Cabernet Sauvignon, it is a backward, brawny, muscular, long distance runner. Consumers lacking patience are advised to steer clear of this wine. Its dense purple color is followed by aromas of graphite, sweet cassis, pen ink, and charcoal. This powerful, dense, concentrated wine possesses high tannins and lots of structure. One of the more backward offerings from the right bank in 2006, it will not be close to drinkability for 8-10 years. Anticipated maturity: 2018-2030. 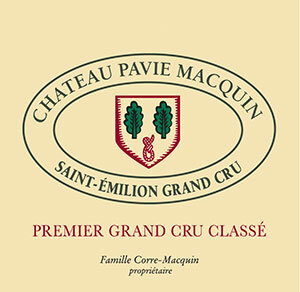 The 2006 Château Pavie Macquin has a ripe, sensual bouquet with copious kirsch and blueberry scents, fine tension and poise, a faint whiff of boot polish in the background. The palate is very elegant on the entry, pure and supple in the mouth, succulent with vivid black cherry and dark plum notes. It is that keen line of acidity cutting through the fruit that takes this Saint Emilion to a higher level and it comes highly recommended. Tasted February 2016.